In 2011, properties across Queensland were devastated by what was called a “one in 100- year” flood event. Just two years later, a number of those same areas are experiencing significant flooding again. Uncontrollable weather events can strike fear into all those with a connection to the town in which they’re taking place, including property investors whose future financial success may be riding on those homes. For those still interested in buying within an area subject to flooding or other disaster, it’s worth remembering that extra protection and insurances may be required. Dr John Ginger, associate professor of civil engineering at James Cook University, is a research director at a Queensland-based cyclone testing station where he conducts studies on the impact of wind loads on different structures, undertakes windstorm damage investigations and helps inform the local building codes. Part of any investor’s due diligence on a property should be a building and pest report. However, this is even more crucial in cyclone-prone areas where newer properties have to fit more stringent codes. The building codes of those areas may specify particular numbers or types of screws required in a property, or the materials used. Currently, he explains, “Houses are designed for windspeeds exceeding [an occurrence of] 500 years on average. Exceeding this wind speed is very unusual, but it could happen within your lifetime. The house is designed to be stronger than the load that it might see in that time,” he says. Older properties may not live up to this same standard, and those that have been built recently may not necessarily stack up. Kerry Lowlett, a property investment coach with Positive Real Estate, owns a property in cyclone-prone Townsville, and two in flood-prone Emerald. “The one in Townsville we don’t really worry about because we built it from scratch, so we know it’s built to the relevant current standards,” Ms Lowlett explains. Investors entering cyclone areas, such as Cairns, where Property Ladder Realty director and investor in the area, Linda Tuck, is located, need to acknowledge that there’s a risk. “You need to do the maintenance and be preventative – have low maintenance gardens and keep things in order,” says Ms Tuck. He recommends that all investors have their properties checked prior to cyclone season, as deterioration can also affect their ability to withstand cyclones. For flood areas, this design aspect of a property is also worth a second look. “Common sense prevails when buying in these areas. If you’re looking, then choose something elevated,” Ms Lowlett explains. Local investors tend to be more comfortable in these areas, says Ms Tuck. They are aware of potential floods and cyclones. “The people here understand what cyclones are, what they can do and what the buildings can do. They’re more comfortable investing. It comes down to the risk of exposure,” she says. What it comes down to is the risk and return equation, and many of the areas are affordable with rent returns of over seven per cent. The capital growth expectations in some areas are still considerable, and a number of disaster-risk areas are regularly tipped as hotspots. “Our experience was when we bought the first one in 2004 for $220,000. We had it valued by the agent and bank in 2007 at about $340,000,” Ms Lowlett explains. Overall, however, the jury is still out on whether or not to purchase in areas with this ‘extra’ risk. Ms Lowlett is still comfortable with her properties, having thought about all the implications in advance. She was lucky to only need to replace the carpet and other minor fixes. With a friend of theirs helping out within five days of the disaster, the timber didn’t have too much time to swell within the property, reducing the possibility of extensive damage. For many investors at the time, who were relying on their property manager to organise the repairs, it took much longer to rectify the damage. Investors wishing to buy in these areas need to consider being proactive. “One of the reasons we went up there and fixed the property ourselves [after the 2011 floods] was because the property managers had numerous [properties] that were damaged and there would be limited contractors,” says Ms Lowlett. For investors who are risk-averse, she advises against buying in these areas. Similarly, those without a decent buffer behind them, to deal with vacancies out of their control, should look elsewhere. Many investors found themselves caught out in 2011, which has brought to light the need for appropriate cover. Investors who have decided to purchase need to minimise their risks as best as possible. “I think people were a bit blasé about insurances [for flood areas] until 2011. People will be less blasé about it now. Insurance companies won’t cover certain areas or towns, and you have to wonder whether it’s affordable,” says Patrick Bright of EPS Property Search. While he doesn’t personally advise investors to buy in natural disaster areas, he explains that investors should always be looking for flood maps, finding out the extent of the damage they may see. “Like most people, we found we didn’t have flood cover. We were always insured with CGU, now they have mandatory flood cover,” says Ms Lowlett. Since 2011, insurances have risen significantly in these areas, making it even more necessary to obtain quotes and ensure it doesn’t affect the bottom line of the investment. “The premium we paid in 2012 was about $3,300, which was about $1,000 more than before. I know that it is not only our insurance that has jumped up; all insurances have jumped dramatically,” she says. Some items are covered by body corporate; however, Archers Body Corporate's Andrew Staehr explains that some investors have been unsure about what they are covered for. “The body corporate doesn’t cover contents, TVs, fridges, floor or window furnishings or airconditioners. They’re the main things. But it does cover fixtures, so the external wall of the building, kitchen cupboards, bathroom cupboards, ovens, shower screens. “For everything else, you’d expect that people have contents insurance,” he says. Some areas are more expensive than others to achieve insurance, while others may not be able to cover themselves at all. Investors must also enter into deals with their eyes open, knowing which insurances cover which part of their property and the likelihood of the damage. Provided they weigh up these risks and assess their own comfort with potential losses, it may be worthwhile purchasing. “[When I initially purchased] I knew that Emerald was periodically affected by flooding, but from what I gathered, it was just the river. Before the 2008 flood they hadn’t had one in 30 years,” Ms Tuck says. While some damage can sound intense, investors should remember that it occurs in specific suburbs, and even some identified regularly on maps as risk areas remain generally unscathed. EPS Property Search’s Patrick Bright explains that the current records are based on historical mapping over time. 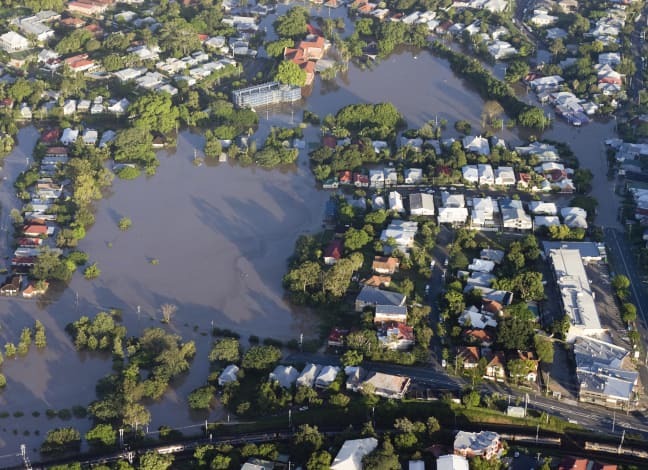 Brisbane City Council's free FloodWiseProperty Reports list the depth of potential flooding, the percentage likelihood of each flood and often the source of the flood. “The council provides flood information regarding a property,” Mr Bright explains, “It’s a risk profile. Mapping also exists for cyclones and bushfires and can be accessed by relevant state and council planning authorities.